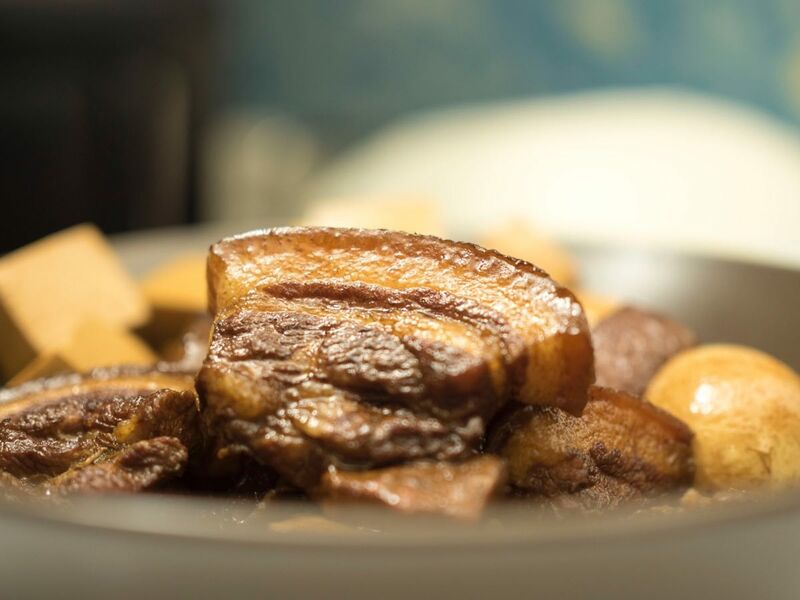 This is the first of my recipes series, and since mother’s day is just around the corner, what better way to celebrate it than to share with everyone my recipe adapted from my mum’s original braised pork. 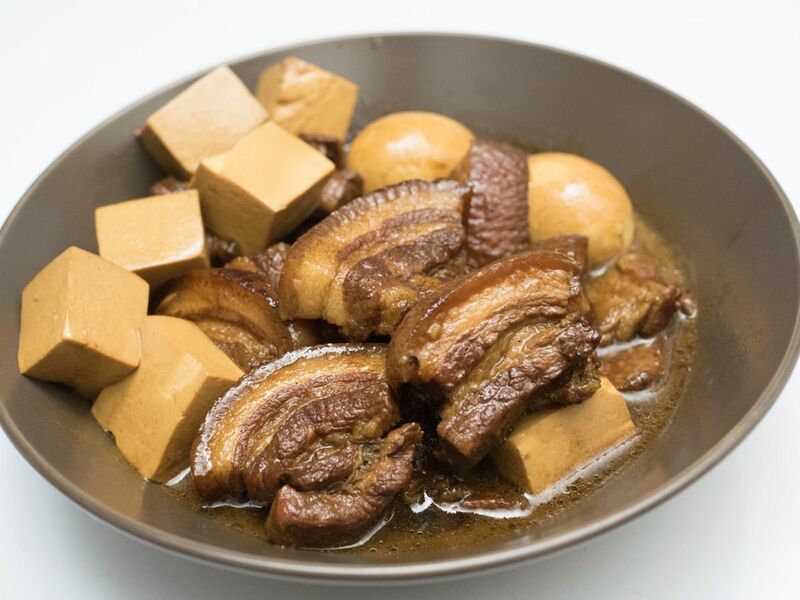 There is a version of braised pork in nearly every chinese ethnic groups, from the Shanghainese ‘Hong Shao Rou’ which is predominantly sweet, to the Teochew style of Lor Bak, which is lighter on the soy sauce, and features some herbs, together with star anise and cinnamon for a more complex flavour. 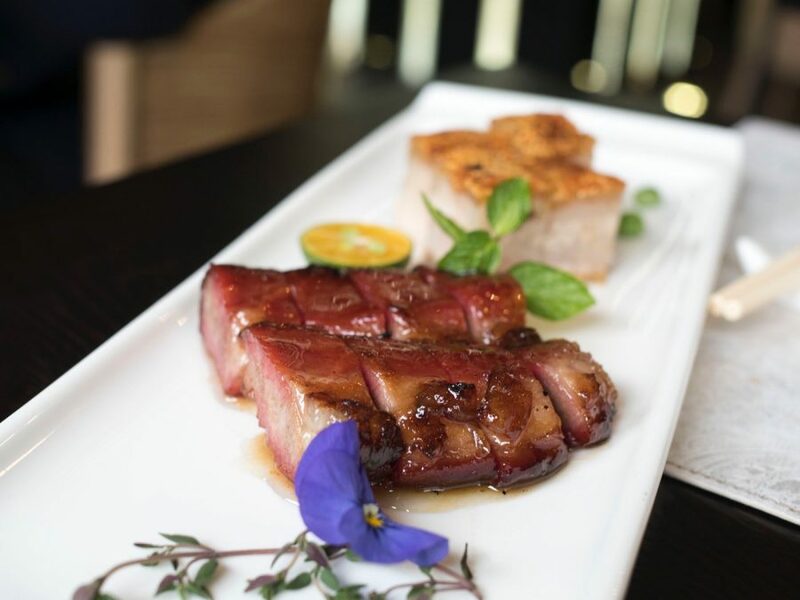 My version is based on the Hokkien (Fu Jian) version, which is also known as Tau Yu Bak, and features a dark braising sauce, enhanced with star anise and cinnamon. Solo Bachelor Style. 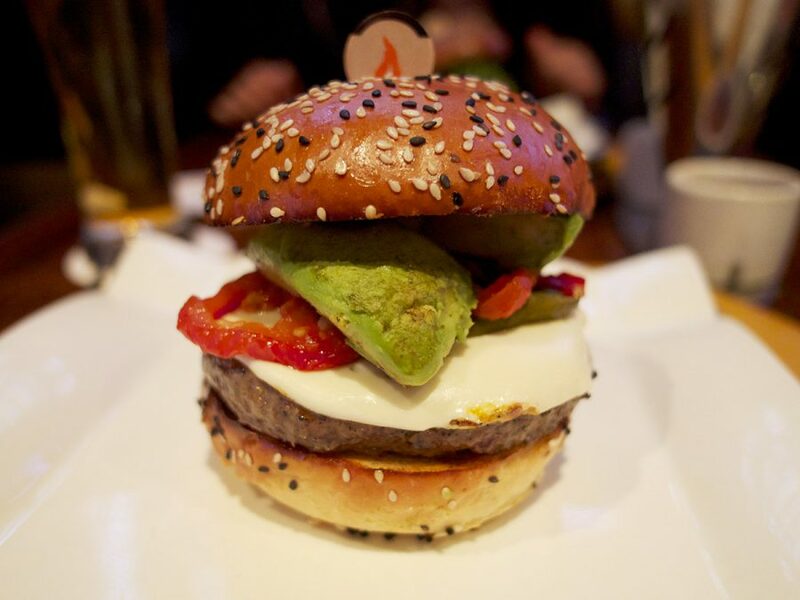 Don’t worry, cook like this and you won’t dine alone anymore. 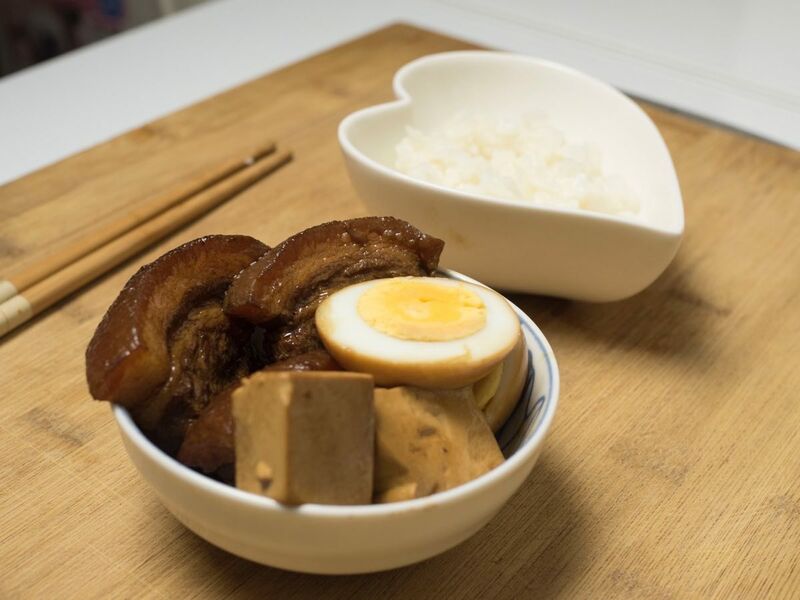 Pork belly is usually the cut of choice, and common ingredients included in the braise are hard boiled eggs and tofu. 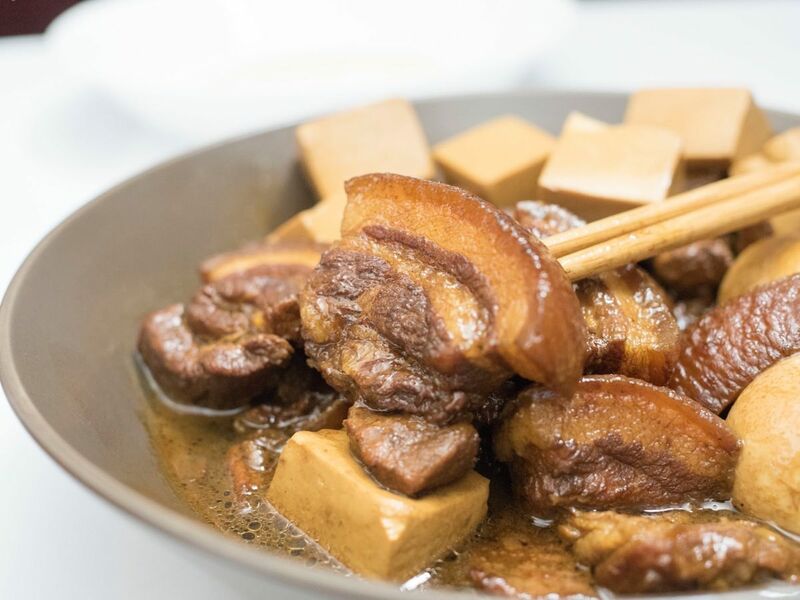 The pork should be braised until tender, nearly melt in the mouth and the salty braising sauce pairs extremely well with rice and even plain congee/porridge. Chinese braised pork is considered one of the ultimate home comfort food by many. I learnt this recipe from my mum when I first came to Shanghai 10 years ago. 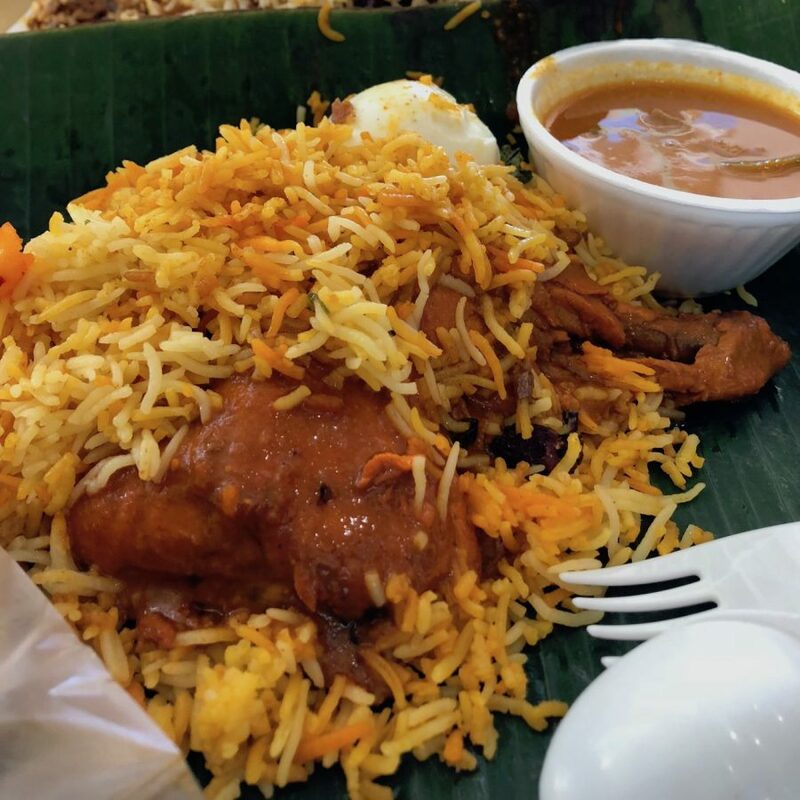 It was one of the first dishes I missed most from home, and I started to learn how to cook it then. I would often bring my braised pork in a lunchbox to work, and exchange pieces with my colleagues. 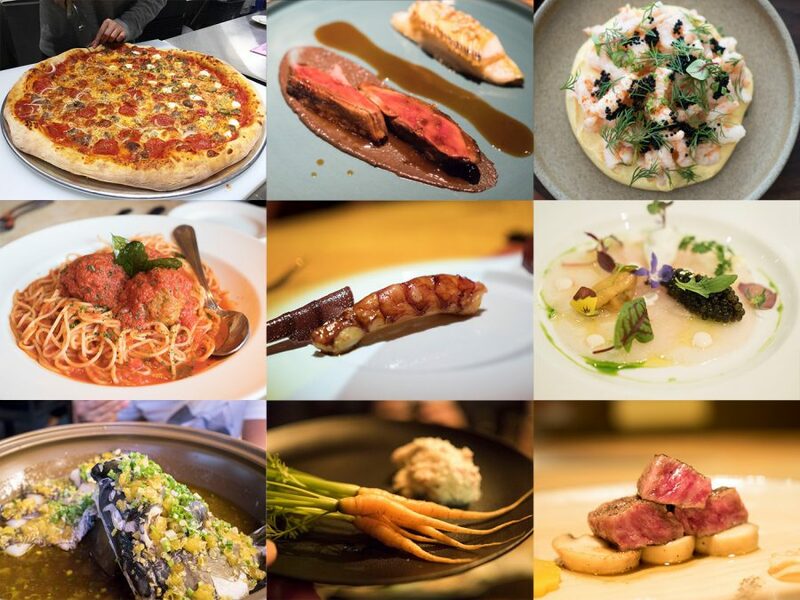 Since then, I have refined the recipe countless times over the past 10 years, eventually sharing it with countless satisfied customers at my restaurant. Today, I will share with you the same recipe that I also use at my Singaporean restaurant in Shanghai, Hello Miss Dong. 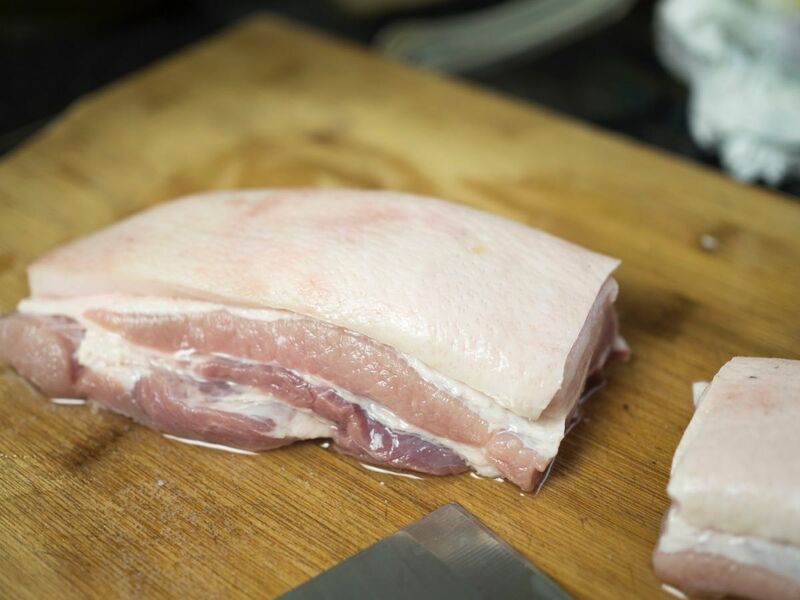 Cut pork belly slab in half, lengthwise and wipe the skin dry with kitchen napkins. 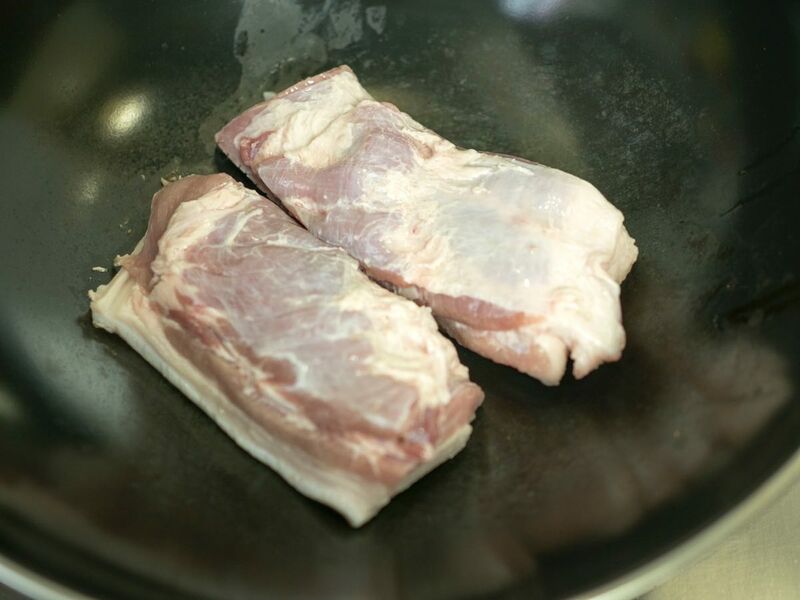 Proceed to sear pork belly skin-side down in a pan on high heat until the skin is slightly charred. No oil is required. 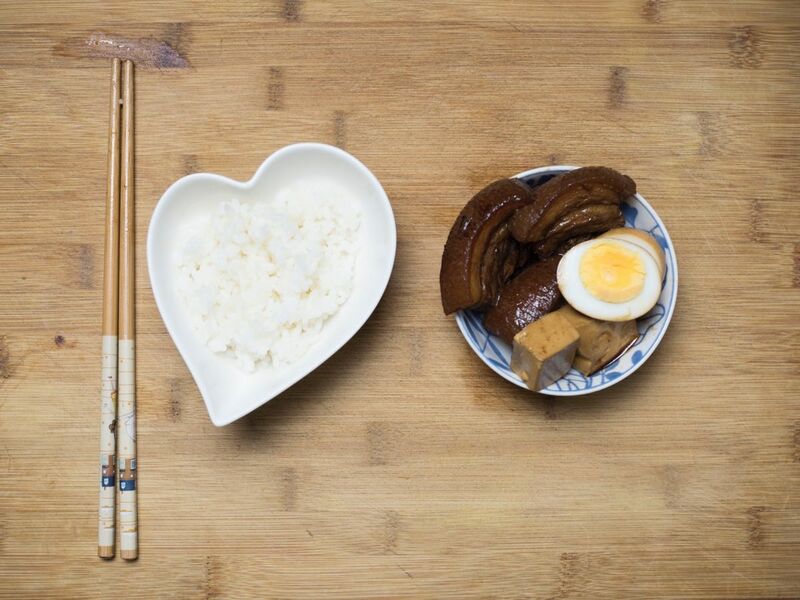 This is a common method of prepping pork belly before cooking in China. 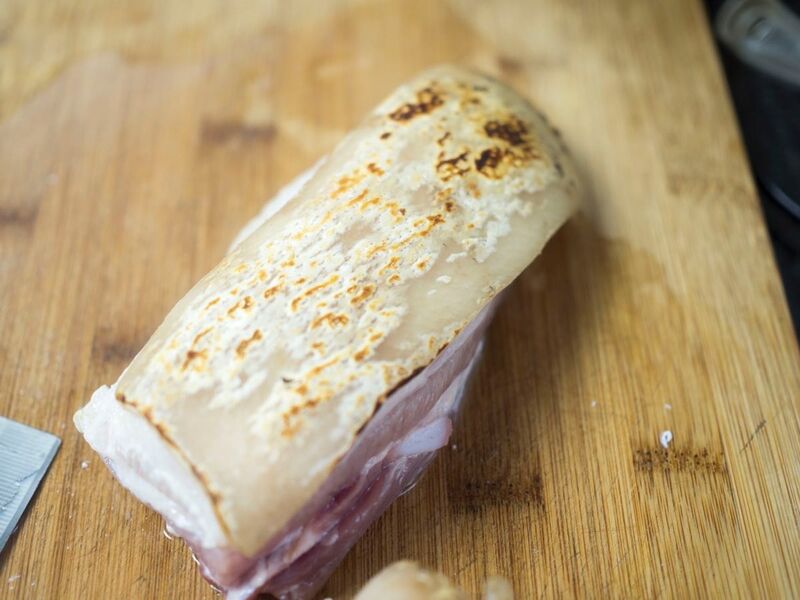 The searing process helps brings out more flavour and texture in the skin, and burns away any hairs that might be present. 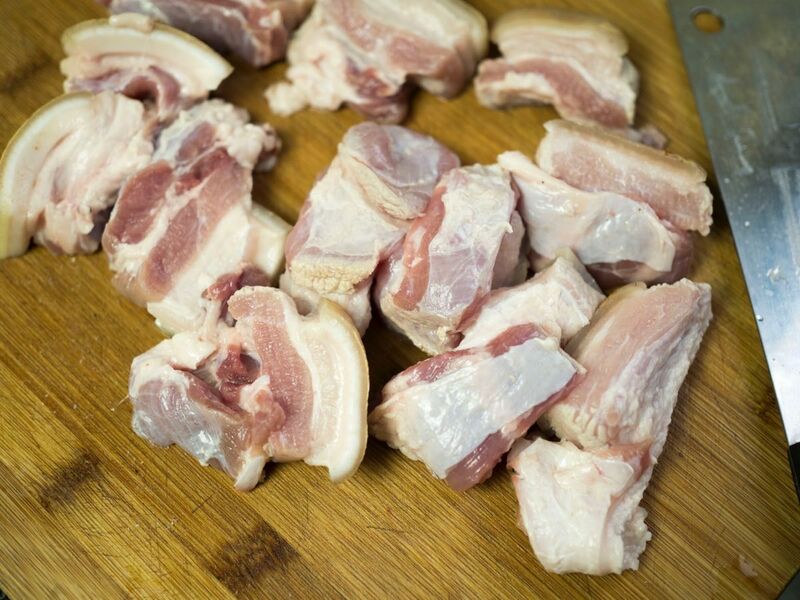 Bring the 2 pieces of pork belly back on the chopping board, skin side down, and carefully cut into 1 inch thick slices. 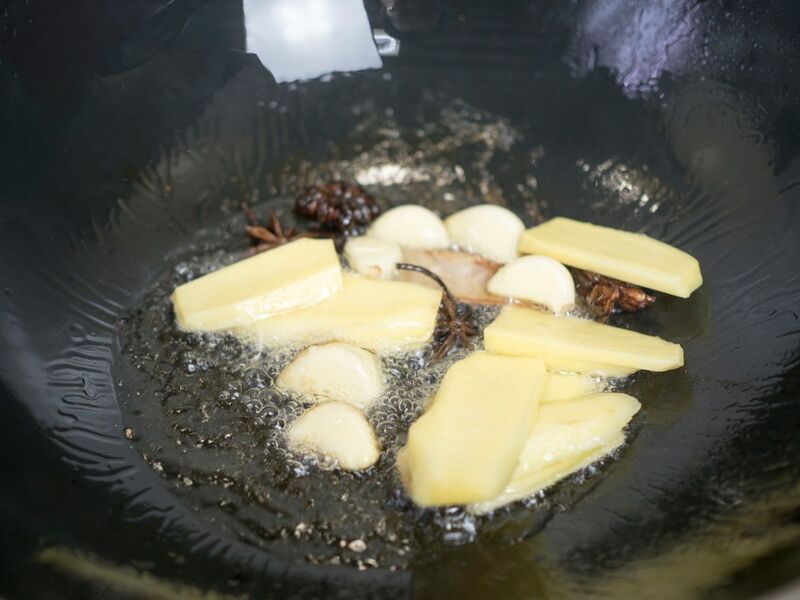 Add about 4 tablespoons of oil to a hot wok on high heat. A dutch oven is acceptable too. You need something that can stir fry and also hold a good amount of liquid for braising. 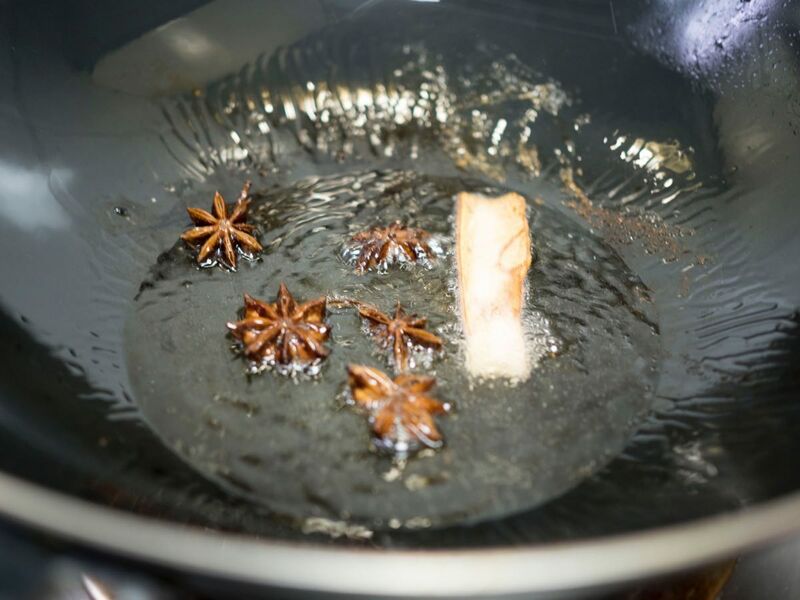 5 seconds after you add the oil to a hot wok, add in the star anise and cinnamon and stir fry for 10 seconds. Next, add in the garlic and ginger slices, and stir fry for another 30 seconds. This process is called sweating and helps to release/awaken the flavour of aromatics. 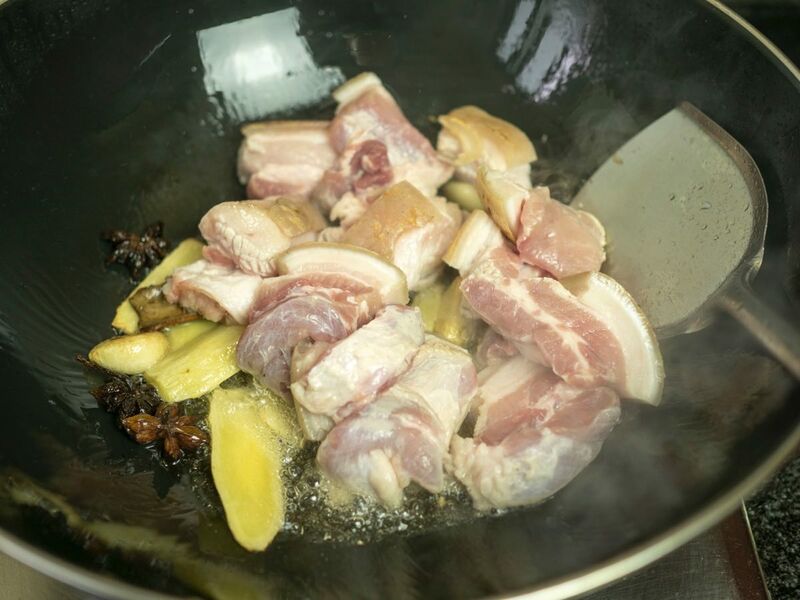 After the aromatics have been sweated, its time to infuse all that amazing aroma into our pork, so add the pork belly chunks to the wok, and stir fry on high heat for 5 minutes. You want to get a bit of color on the meat as such. 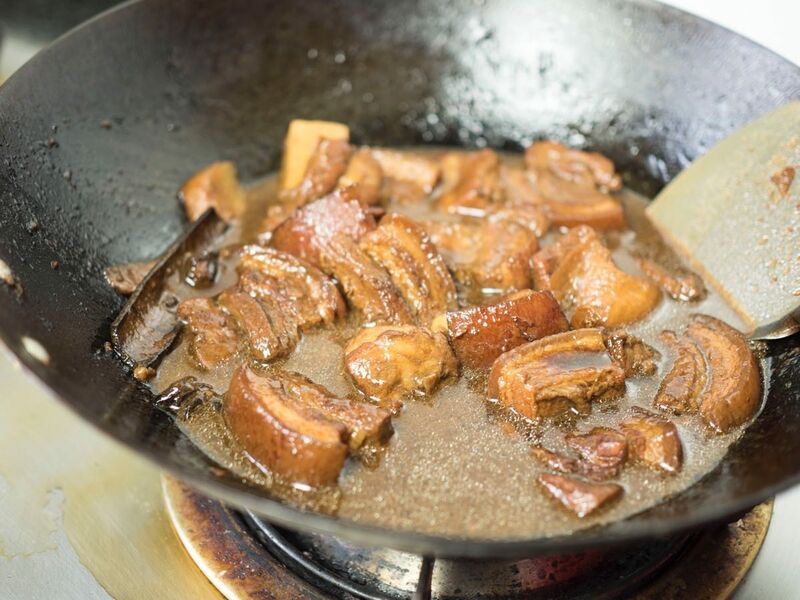 Once the pork has been stir fried for 5 minutes and has some caramelisation going on, add in the light and dark soy sauces, along with the small piece of rock sugar. 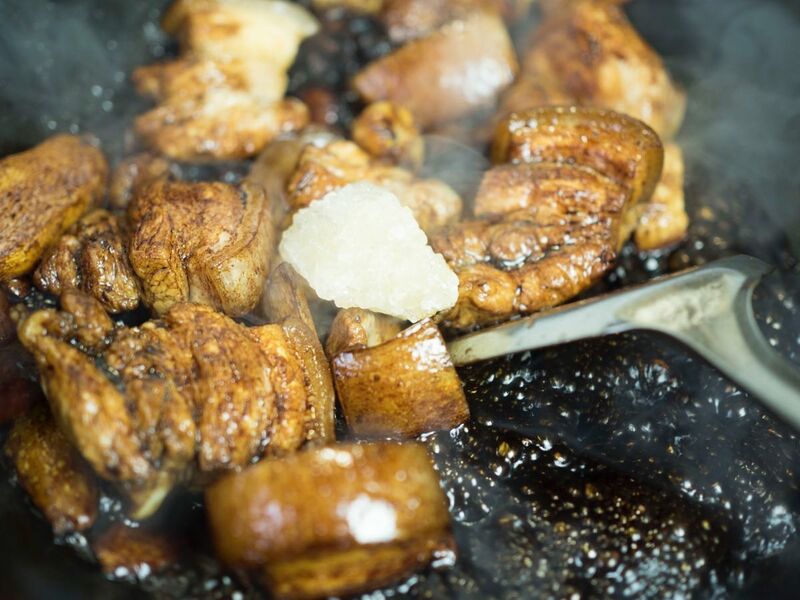 The wok will sizzle at this point, turn down to medium heat, and continue stir frying the pork and aromatics to coat the pork well with the soy sauces. Stir fry for 2 minutes, and then add in 4 bowls of water along with 1 tablespoon of salt. A bowl is the chinese equivalent measure of a cup and usually refers to a typical chinese rice bowl, which is roughly 1.5 cups. After the water has been added in, turn the heat up high until the braise starts to boil. It should look like a soup at this point. 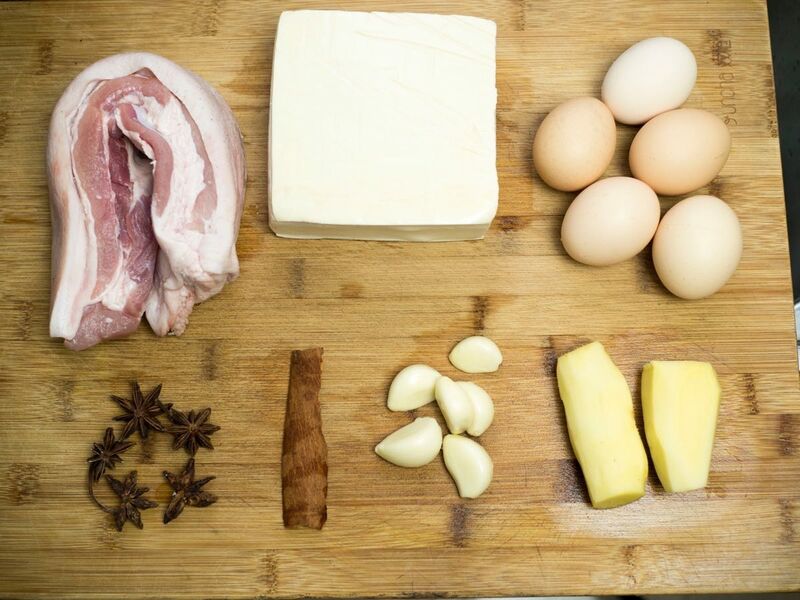 Don’t worry, we’re reducing all this down to a rich and savoury braise. Once the braise starts to boil, turn down to low heat, and set a timer to 2 hours. This will be gently braised for 2 hours. Next up we will prepare a separate small pot to braise the eggs and tofu. Bring a small pot of water to the boil, and then gently put in the 5 eggs, and set a timer for 7 minutes. 7 minutes later, turn off the heat and let them sit for another 2 minutes, before running them under cold tap water to cool off. 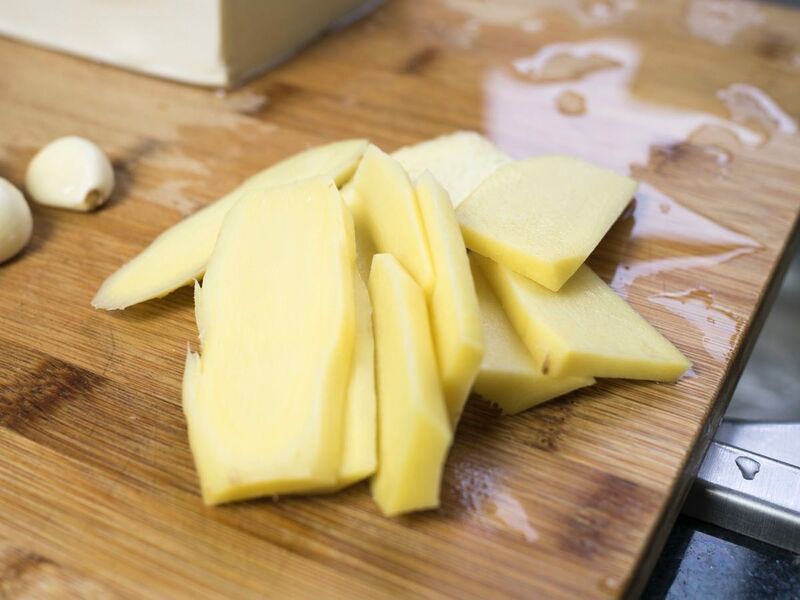 Peel, and set aside. You now have perfect hardboiled eggs that don’t have the frowned-upon grey ring of death. Eggs are actually quite easy to get right because the process is mostly science. 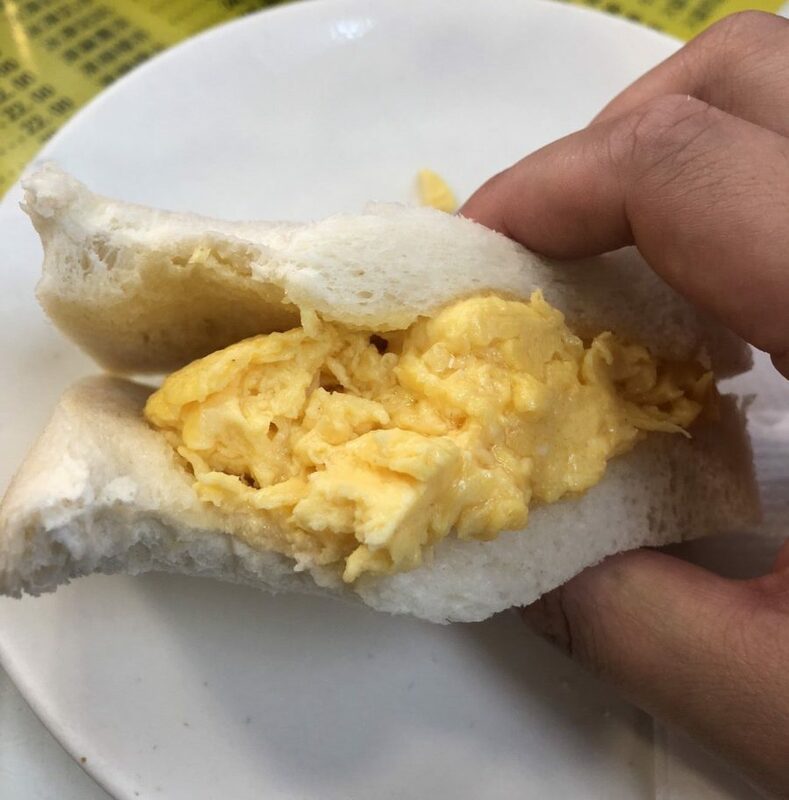 I will write another post about cooking eggs another time. Ladle 4-5 scoops of braising liquid from the wok into the small pot, and then top up with water so it’s 3/4 full, but no more than 4 bowls of water. Add another 2 tablespoons of light and dark soy sauces, and turn heat up to high to bring to a boil. We have just used the ‘mother-braise’ to create a child-braise. In some traditional restaurants in China, they have a mother-braise that have been cooking for tens of years. Once the new braise is boiling, taste to see if the braising liquid is flavourful and salty enough. It should be very savoury and quite salty; Too salty to drink on its own. 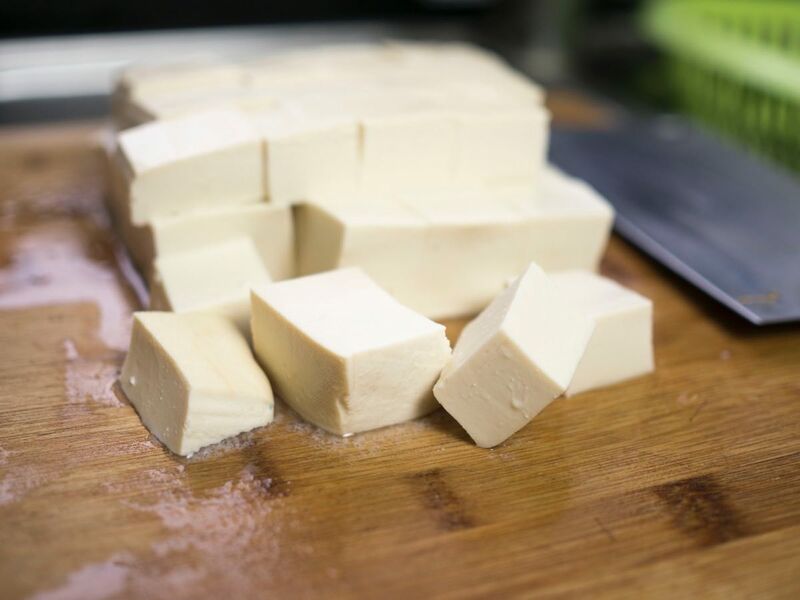 Add the tofu cubes in, and cook for 10 minutes on low-medium heat. 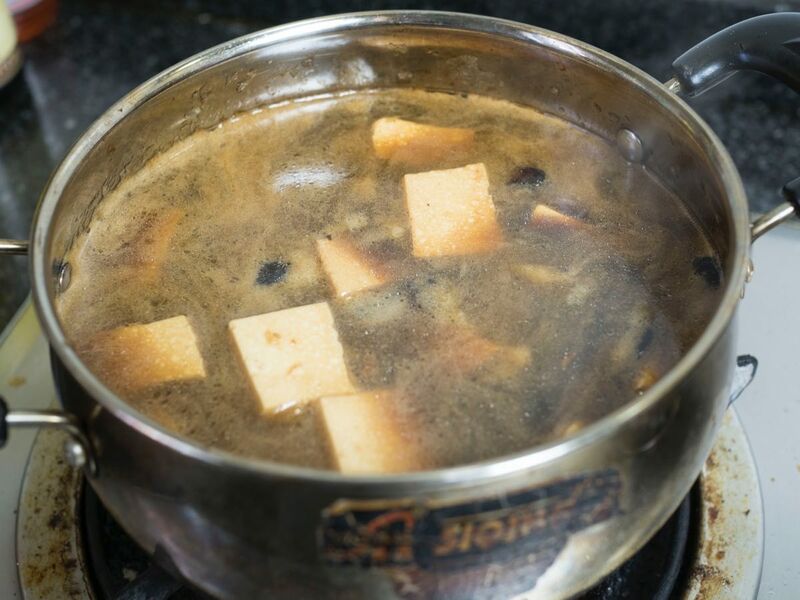 You don’t want to boil the tofu, because the bubbling will break up the tofu. 10 minutes later, turn off the heat, and add the cooked hardboiled eggs in. Make sure the eggs and tofu are all submerged in the braising liquid. Put aside. 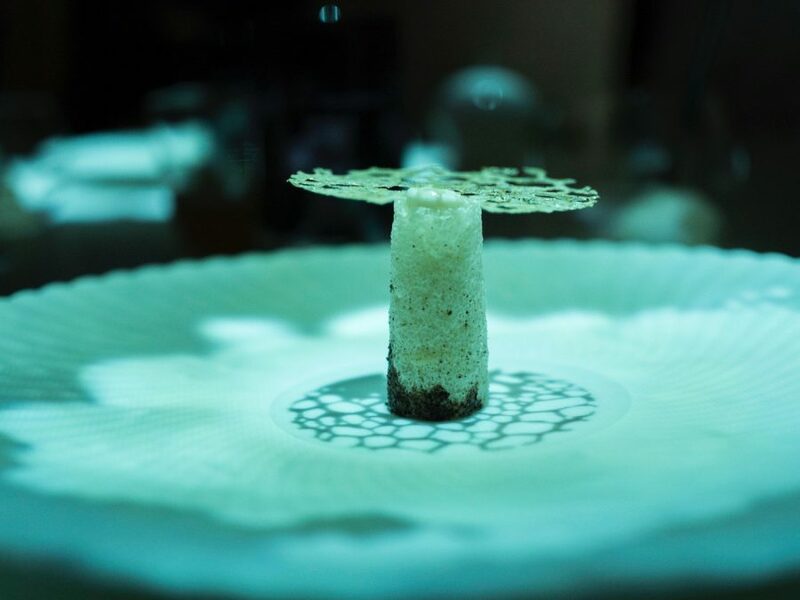 Contrary to popular belief, food absorb flavours better when they’re cool, as opposed to continuous cooking. This is why braised and curry dishes always taste better overnight, even though they’re just chillin’. The braised pork is ready to serve in 1 hours time, but best eaten after at least 6 hours. The best time to prepare this dish would be either early in the morning so you can have it for dinner, or at night so you can have it the day after. Always check on your main wok every 20 minutes to see if the braising liquid had dried up, or there is something burning in the middle of the wok. On low flame, this shouldn’t be the case. This is what the contents should look like in the final stage. 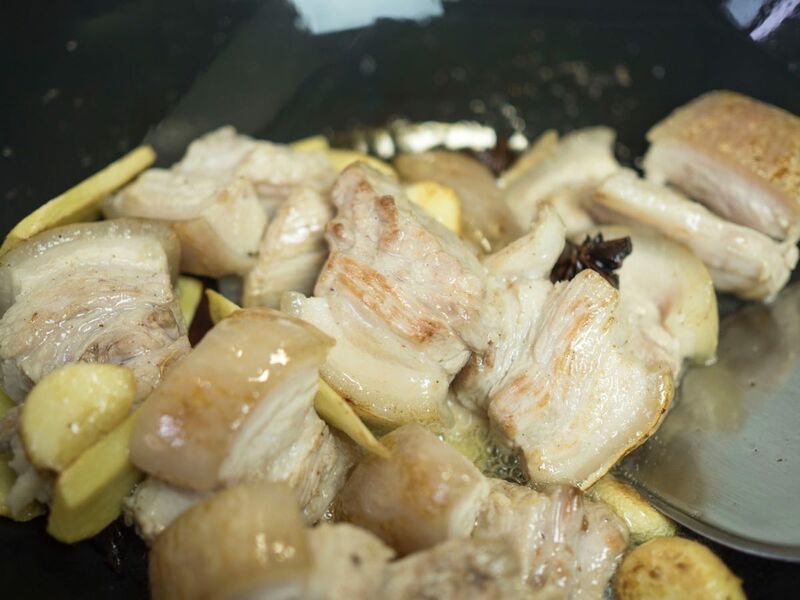 Once 2 hours are up, you should have very tender pork belly chunks, with the skin easily pierced through with a fork/chopstick. If the meaty areas are still chewy, feel free to allow it to cook another 30 minutes. 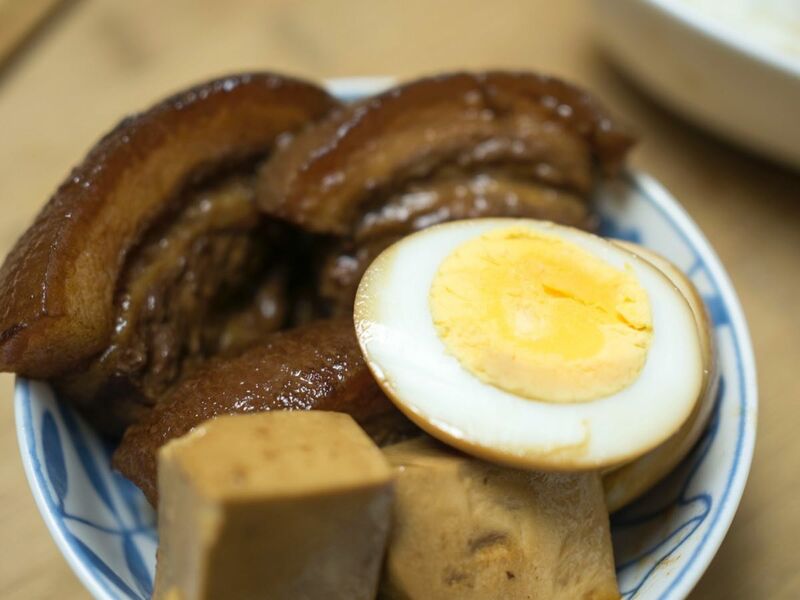 While it is ok to plate and enjoy the dish at this point, it is best eaten at least 6 hours later, because the pork, tofu and eggs would have absorbed a good amount of flavour by then. Enjoy with white jasmine rice or some congee.